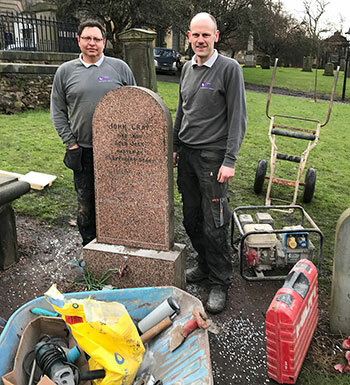 The repair was donated by funeral director firm William Purves when chairman, Tim Purves, heard City of Edinburgh Council would be unable to repair the stone for a memorial event to mark the 160th anniversary of John Gray’s death. Tim, who leads the fifth generation of the Scottish family firm, contacted the council to arrange a memorial repair in time for the anniversary event. The legend of Greyfriars Bobby dates back to the late 19th Century. The Skye terrier is said to have kept a constant guard over the grave of its owner John Gray, also known as Auld Jock, in Greyfriars Kirkyard for 14 years. A memorial to the dog and his master’s grave are among the capital’s most visited landmarks. News of the rescued stone prompted an international response with messages of thanks from tourists, dog lovers, residents, heritage groups and locals alike and was covered in the national and regional media.